KABUL - NATO leaders agreed to an "irreversible" transition to withdraw almost all foreign troops from Afghanistan by 2015 at the end of landmark two-day meeting in Chicago, while both the US and President Karzai warned that the risk of the country's instability is still high. Similar to his address to the US nation on May 2 from Afghanistan's Bagram Air Base, US President Barack Obama sought to appease the American public with statements like "the Afghan war, as we understand it, is over" in his public address. However, in order to shore up support from the NATO allies to continue the war efforts until 2014 and the funding of the Afghan security forces until 2024, Obama emphasized that the risks were still present. "I don't think that there is ever going to be an optimal point where we say, 'This is all done. This is perfect. This is just the way we wanted it and now we can wrap up all our equipment and go home.' There is a process and it's sometimes a messy process, just as it was in Iraq," he said. President Hamid Karzai made similar statements in his address at a gathering of the international leaders warning that the "menace" of insurgents has "dire consequences not just for the stability of Afghanistan and Pakistan, but for...the world as a whole". "More than a decade into this fight, terrorism remains a serious threat, and extremism and radicalism are on the rise," he said. The annual cost of sustaining Afghan security forces is estimated at $4.1 billion, and a key aim for Obama and Karzai was to keep the pressure on NATO's member states to not back down financially while they are confronting ongoing economic crises. The determination of France's new president Francois Hollande to stick to his election promise of pulling the nation's 3,400 troops out by the end of this year overshadowed the alliance's campaign to stay the course set by NATO in Portugal two years ago. 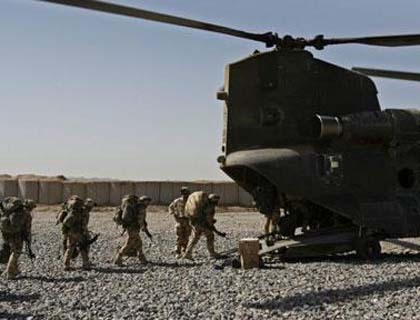 The summit's concluding statement confirmed the NATO-led mission would hand command of all combat missions to Afghan forces by the middle of 2013, and would withdraw most of the 130,000 foreign troops by the end of the following year.